Manchester Event Security, Door Supervisors, Door Staff. Spartan Event Security are quality providers of licensed door supervisors, offering security services to all areas of the licensed industry from small bars, pubs and restaurants to clubs and larger entertainment venues. The leisure industry is a particularly unpredictable business, requiring constantly changing attitudes and approaches to many different situations. 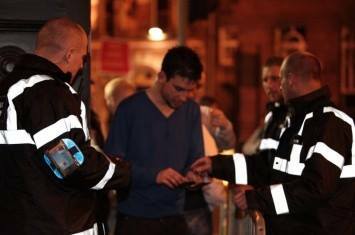 We frequently supply door supervisors to leisure and entertainment venues in Manchester and many other areas the North West of England. Here at Spartan 24 Hour Security our highly trained, licensed Door Supervisors are ready to adapt to any given situation at any given time. All our staff are trained to resolve situations in a non-confrontational manner, wherever possible, but they will not tolerate and are committed to prevent any manifestation of intimidation, aggression, violence or bigotry at our clients venues. Spartan Event Security provide Door Supervisors for Pubs, Nightclubs, and Events. Door Supervisors are SIA badged, fully insured, screened and vetted. Door Supervisors have a positive attitude, flexible, reliable, with a great deal of common sense. Door Supervisors are hand picked, mature and highly experienced individuals. Have a high standard of presentation, excellent written and verbal communication skills. Door Supervisors are first aid trained and have attended a three day first aid at work course which is HSE approved and certified.